The story of BC&G freight cars that were in interchange service is a pretty easy one. There was only one type of car...hoppers. Actually, for a 19-mile long shortline, it's pretty amazing that the road had interchange cars at all, and at the peak the BC&G had 900 hoppers in interchange service. This photo appears on page 19 of the Warden book and shows the paint scheme more commonly seen in photos. 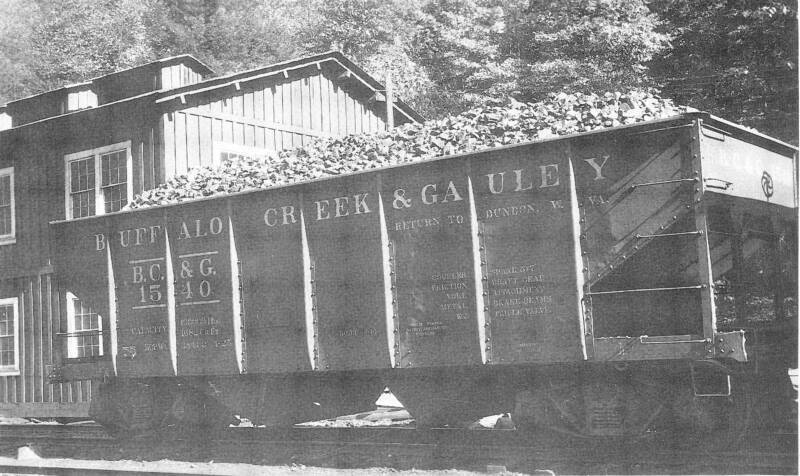 The BC&G's second order of hoppers was built in 1929. An additional three hundred (300) cars were ordered numbered 1601-1900. These cars were just slightly larger in terms of interior volume even though they were slightly shorter over the striker plate. Additional information on the transfer of the BC&G hoppers to the B&O is found in the ORER data. The 1940 issue shows all 900 hoppers still listed on the roster of the BC&G. 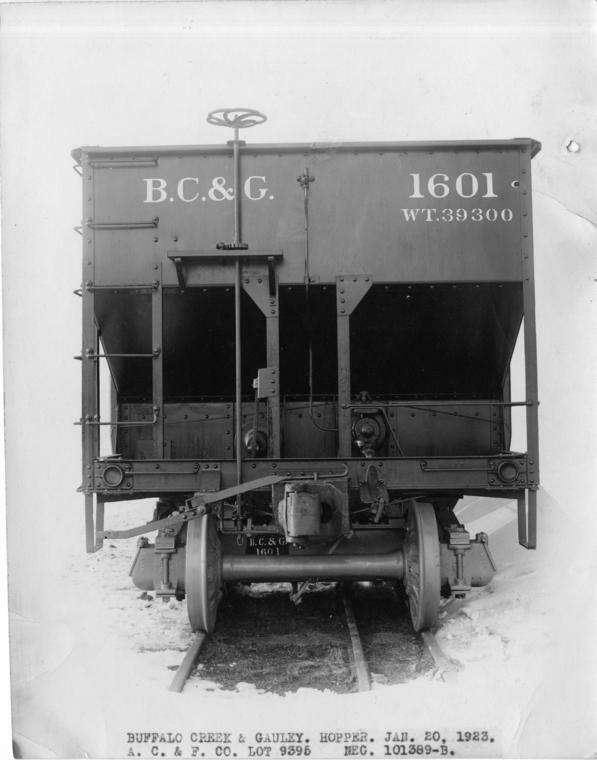 A note in the BC&G section in the 1945 edition indicates that information on BC&G steel hoppers 1001-1900 is contained in the B&O section of the Register. This is consistent with Kirstatter's findings above. 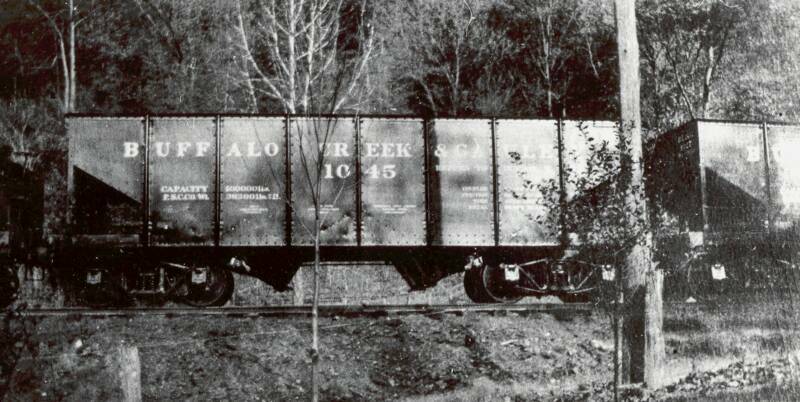 The B&O section of the 1945 registry indicates that 24 of the first series of hoppers and 119 of the second series of hoppers were in service in 1945 under B&O control. That differs slightly from the Kirstatter finding of 41 cars on the B&O roster in 1945. The fact that 119 of the second series show on the B&O in 1945 indicates that at least some of the 300 had found their way to the B&O by then. 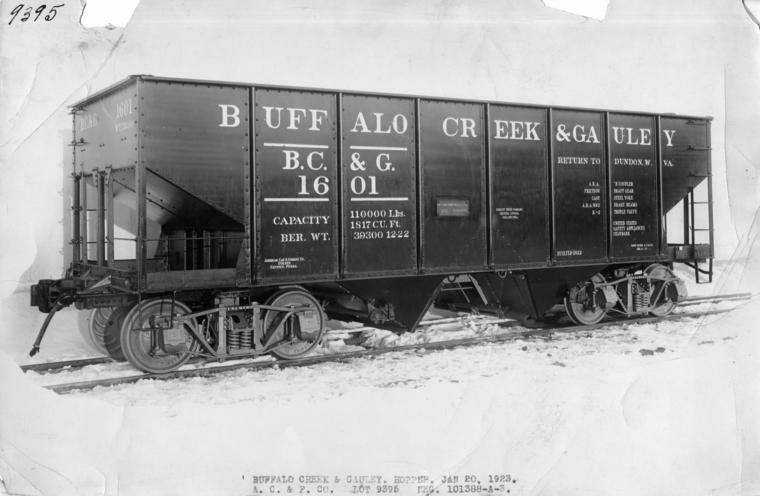 Addtional issues of the ORER might show exactly which year the cars were transferred from the BC&G to the B&O and when they were actually taken out of service. 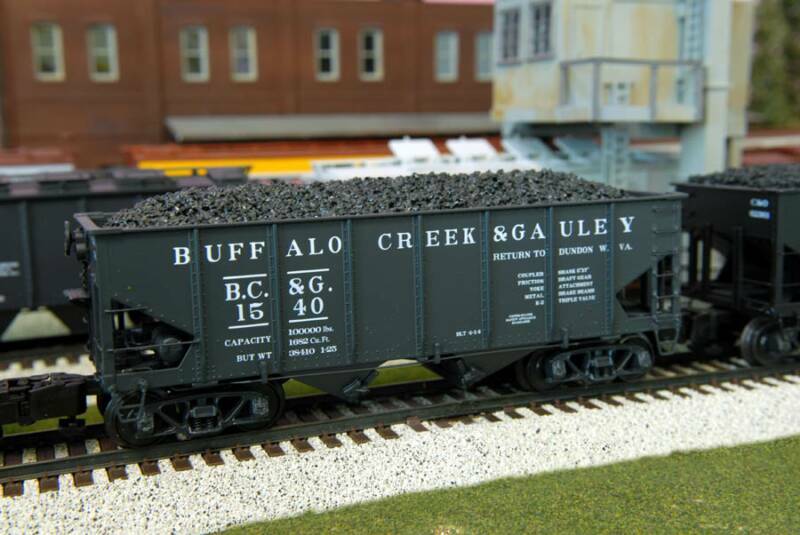 As indicated on the ROLLING STOCK - MOW page, in the end six (6) hoppers remained with the BC&G and were used in MOW service. 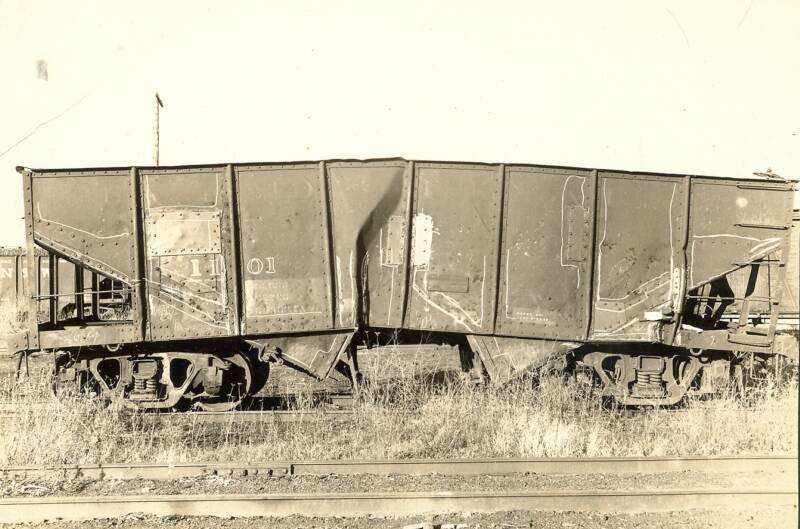 I have seen no good photo showing the sides of one of the second series of hoppers. In the photo above, the three hoppers on the left are from the first series (#1204, #1561 and an unknown number). The hopper on the far right is #1778 and is from the second series. The differences in the end constructionbetween the two series are obvious. See also the photo for of Engine #3 for more views of BC&G hoppers. BC&G #1101 suffered some serious damage at some point! This would make a fascinating model! The date and location of this photo is unknown, but it was clearly not taken on the BC&G. While not an exact replica, this model was built from the photo above left. I've included it because the b/w prototype photo is not too clear. Note that the lettering on the end of the car goes clear across the width, an unusual configuration. Very little documentation of rolling stock is available for the very earliest years. According to the Warden book, "intially the road was operated with wooden hoppers and gondolas". this comment is substantiated by the photo to the right which clearly shows wooden gondolas lettered BC&G on the left. Click on the photo to enlarge. 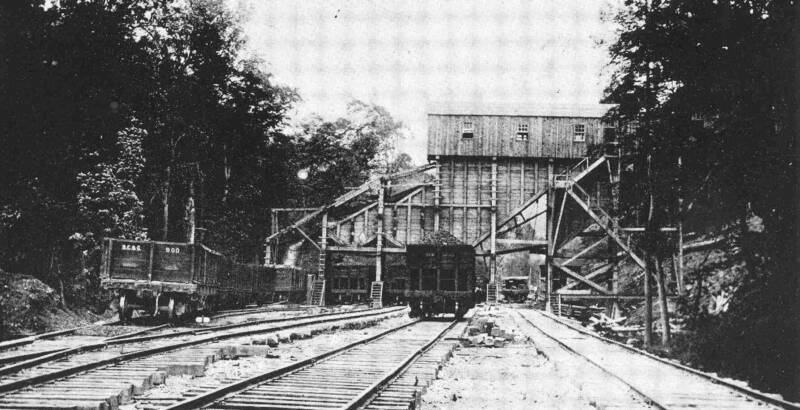 The lettering on the hopper in the center of the photo cannot be read even when enlarged so it cannot be confirmed whether this is an early wooden BC&G hopper or not. It does not have the end construction of the steel BC&G hoppers (see below). 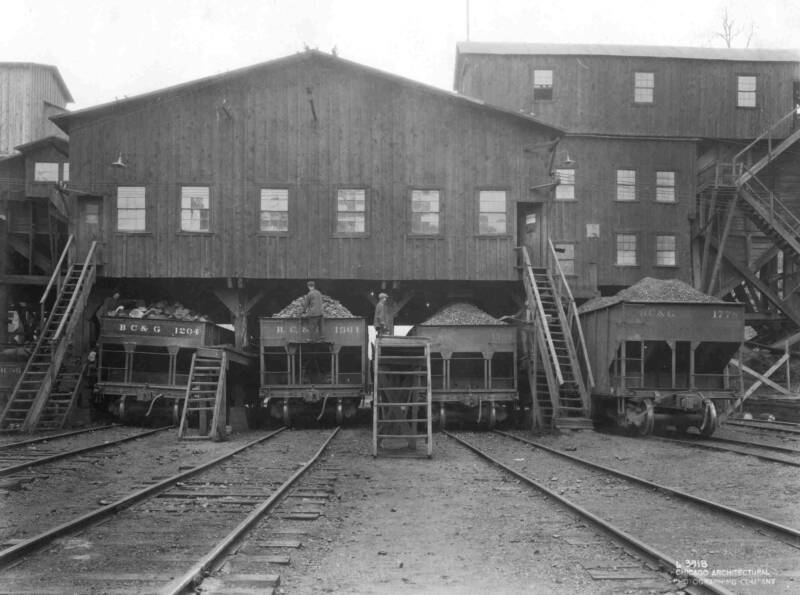 Between 1911 and 1914 the BC&G had 600 steel hoppers numbered 1001-1600built by the Pressed Steel Car Company. These were basically copies of the successful PRR GLa hoppers. They had a capacity of 50 tons. 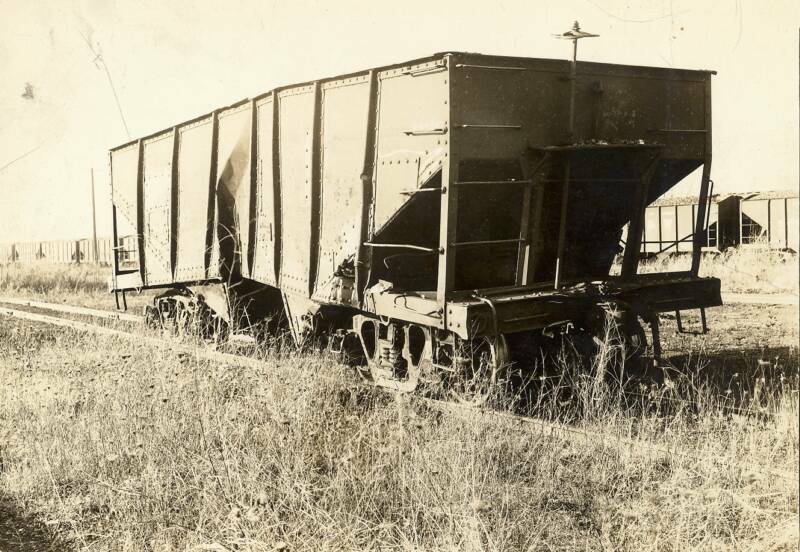 This photo, the earliest I've seen of one of these hoppers, looks like it might have been taken soon after the cars arrived on the property. Notice that the intitials of the manufacturer are visible on the left end of the car. The lettering scheme is different from the more familiar scheme in the photo below. 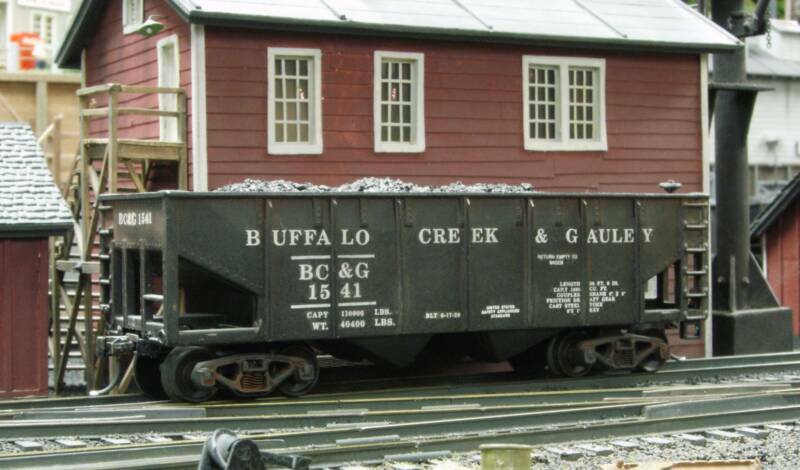 This 'S' scale (3/16") model of the Buffalo Creek & Gauley hopper is was manufactured by S HELPER SERVICE, one of the premier manufacturers of 'S' locomotives and rolling stock while they were in business. The cars are very highly detailed and were produced in four different road numbers. B&O historian Ed Kirstatter has provided this drawing from a B&O roster book. It shows the dimensions of the first series of BC&G hoppers. They were sold to the B&O in 1945 as indicated in the notes at the top center of the drawing. These cars became B&O class N-38 and were numbered 20000-20040 indicating that only 41 of the original 600 cars went to the B&O. Per the note on the drawing the lowest numbered car that went to the B&O was 1026 and the highest numbered was 1482. The disposition of the remaining cars is unclear. This drawing from the B&O roster book, also from Ed Kirstatter, shows that the second series of BC&G cars became B&O Class N-39. The date of purchase by the B&O is not specified on the drawing, but it is possible, if not likely, that both these and the first series were acquired at the same time in 1945, although that is speculation. According to this document, amazingly all 300 cars were transferred becoming B&O 20500-20799. This drawing indicates a construction date for these cars of 1923. That means that all 300 cars lasted through 22 years of BC&G service, at least, before becoming B&O cars. 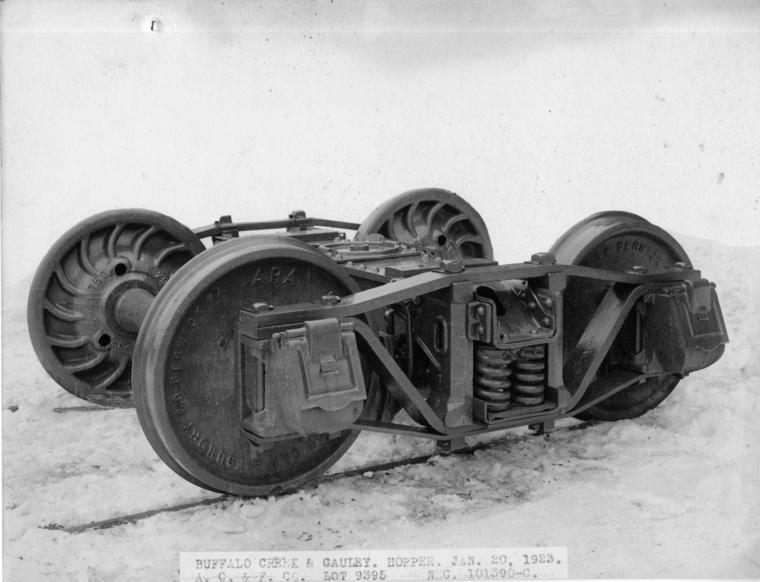 1451 - Destroyed at Bentley, PA on the Pittsburgh & Lake Erie, Sept. 2, 1920"
Here are three builders photos of the first car in the second series of hoppers built for the BC&G. These were found on the internet in the Barriger collection in Flickr.